The beautiful Nettle Anemones are likened to "flowers of the sea" and make an attractive centerpiece in a cold water reef! The Nettle Anemones are another group of cold water anemones. There are 9 species in the Urticina Genus, each with a unique range in the northern European seas, or North Pacific seas from the coast of California to Alaska. They are sometimes used in research and although they are generally unavailable to aquarists, they are very useful to the medical community. You can see these guys along coastline shoals in intertidal and subtidal areas of colder northern waters. But they are best left alone as they need cold water to survive. The name Urticina means "nettle", which is a stinging plant. Like all sea anemones the Urticina anemones do have a strong sting. But the beauty of these sea anemones cannot be denied, it has led them to also being called "flowers of the sea". Some of these colorful anemones are rich solid reds while others are very festive, covered with contrasting stripes and blotches. They use their venomous cells or nematocyst found in their tentacles to sting and deflect any possible threats or attacks but mostly utilize them for stunning and capturing prey. Many species will retract their tentacles and close up if the water is sparse during low tides. They eat sea urchins, small fish, crabs, and mussels. Some predators, can be certain nudibranchs, sea stars and snails. Unlike tropical anemones, the Urticina are pretty much stationary. If they are properly fed and have the proper water conditions they tend to stay put. In size they are moderate to large, ranging from 3" to 10" (7.6 - 25 cm) in diameter, and 11" (30 cm) tall, or more. They are relatively hardy with some species being kept in captivity for more than 60 years. The Christmas or Northern Sea Anemone has a few name that reflect the temperature of the waters they are found in.... cold! 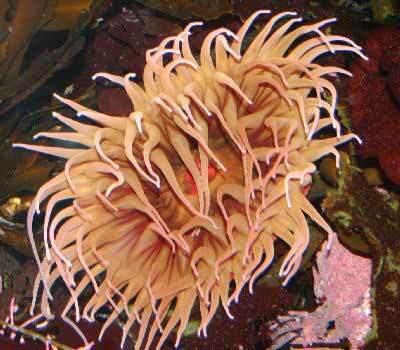 They are similar in appearance and stickiness of most "rock anemones" and are easy to feed. The challenge is keeping your tank between 50.0 to 68.0° F (10.0 to 20.0° C), provide enough light and good water movement. They are great in a cold water nano tank and are easy to feed! This is a cool video of a Dahlia Anemone in the deep waters of the subtropic. They need lower temperatures in the mid fifties to lower sixties to survive. Pick up a chiller before you make your purchase! They are quite beautiful with their contrasting pinks, tans and reds! Only growing to 6," they can be kept in a smaller tank which may be cheaper to keep cool! Water quality must be high and they only need to be fed a few times a month so that shouldn't be too hard! The Fish Eating Anemone, Urticina Piscivora, does just that.... it will eat fish. If you decide you would like one, your first purchase would be a chiller, since this is a cold water anemone needing temperatures from 55 to 60˚F. If you can find a Painted Greenling, Oxylebius pictus to purchase, this fish from a family from the scorpionfish Order, it will HOST the anemone. This fish will grow to almost 10," so the tank should be a good size. Avoid purchasing clownfish, since the Fish Eating Anemone will eat them. This is a very cool combo for a species specific cold water tank! This video shows how the White-Spotted Rose Anemone spends it's day. They do, of course, require cold water marine tanks and are found from the Alaskan Coast to the California coast. They only need to be fed a few times per month due to the cold water and they do not host clownfish. Only reaching 6," they are great for a cold water marine nano tank! Sea Anemone Species: The Urticina genus was described by Sebens & Laakso in 1978. They belong in the family Actiniidae and there are currently 9 species in this Genus. This genus is not on the IUCN Red List for endangered species. Species in this genus include U. asiatica, U. consors, U. eques, U. mcpeaki, and U. sulcata. Another well known species, previously in this genus, is Urticina lofotensis known as the White-spotted Rose Anemone. However from a recent revision by Sanamyan & Sanamyan in 2006, it is now described as Cribrinopsis albopunctata. Sea Anemone Habitat: Urticina Anemones are found in areas of shallow tidal pools or mid-tidal areas, and down to depths of 656 feed (200 m) depending on the species. They like to hang out under ledges, in crevices of rocks, or on the sides of rocks. They are found solitary, in small groups, or they can be found in full colonies that form "carpets". Sea Anemone Predators: Some sea anemone predators of Urticina anemones can be certain nudibranchs, sea stars and snails. What do sea anemones look like? : The Nettle Anemones grow from 3" to 10" (7.6 - 25 cm) and some can reach as tall as 11" or more (30 cm). Their body form is the polyp which is composed of a pedal column with an oral disc on top that has a mouth in the center. They have a "foot" at the bottom of the pedal column they use adhere to various surfaces. The pedal column can be a variety of colors, depending on the species. Urticina anemones use their foot to move around if conditions are not ideal. They can also move by inflating themselves, detaching from the surface, and then rolling along with any current. They will move to avoid predators like starfish, but in the aquarium it is primarily if they are unhappy with the water conditions or the food. There are stinging tentacles positioned around the margin of the oral disc. The tentacles can be arranged in a few ways such as being just on the margin or outside edge of the oral disc, or most of the way onto the oral disc, but there is usually a space around the mouth area. The tentacles can be solid or banded. The mouth should be closed and tight. It will open when hungry, having an oval look, yet a gaping mouth is a warning signal. The Urticina genus take food in and expel waste through this same opening. Sea Anemones Life Cycles: It is unknown how long they all live in nature, but some species have lived from 60 t0 80 years. Hardy aquarium anemones: The Urticina genus can be be moderate to difficult to care for since they do have specific lighting needs and must be in cold water. The Urticina anemones have proven quite hardy and durable, but some are a bit sensitive. These cold water anemones need more specific care than tropical anemones and many need perfect treatment from the start. What do sea anemones eat: The Nettle Anemones are carnivores. In the wild Urticina anemones eat such prey as sea urchins, small fish, crabs, mussels, gastropods, chitons, barnacles, and they may feed on stranded jellyfish. They use their venomous cells or nematocyst found in their tentacles to sting and deflect any possible threats or attacks but mostly utilize them for stunning and capturing prey. In Captivity feed your Nettle Anemone chopped silversides, shrimp, krill, and mussels, fresh chopped fish (from your grocery store), as well as frozen carnivore preparations. Feed once a week or twice a month, since cold water anemones have much slower metabolisms. Aquarium parameters: The typical reef environment is best for these anemones, but it must be a cold water reef. It is a good idea to Invest in a chiller before you obtain one of these guys. Like most anemone species, they need live rock or some other solid material they can attach to. Water changes of 10% bi-monthly or 20% a month are typical for most anemones. One of these average sized anemones is equal to one fish as far as waste production is concerned. Minimum Tank Size / Length: 10 to 50 gallons (38 L to 189 L), depending on the species. Marine Lighting - How much light for anemones: Moderate to high. Many come from shallow waters in the wild, and these anemones will do their best with stronger lighting. Sea Anemone Ailments: None really, unless your lighting, water movement, feeding and water quality are low. Then your anemone will detach to look for "better conditions." Be sure your pump intakes are covered, or this can results in an unpleasant experience with a water pump. All anemones are semi-aggressive because they can be mobile, although most of the cold water anemones stay still if their needs are met. It has often been suggested to not put anemones in a reef environment since corals cannot move away from the stinging tentacles. Once you get your anemone situated and it has not moved for several months, it might be safe to add other corals. Just keep in mind these anemones will sting everything they can reach, like corals and other invertebrates. Anemones will move if your lighting is not good, or the water quality is not to their liking. After splitting, anemones will tolerate their own "clones" and sometimes their own species. All anemones in the tank need to have their own space, otherwise there can be a "chemical" warfare between species. This will usually cause one to not eat, shrink and eventually die. Having excellent filtration and a large tank will usually allow 2 anemones at opposite ends to thrive. You can also build a natural blockade to help prevent them from wandering into each others "space". The Urticina anemones should divide in captivity, but there is no information on propagation of cold water anemones. It may be just like other anemones. These cold water anemones reproduce by external fertilization of egg and sperm. When they spawn, they produce larvae that will float away, and eventually finding a spot to land. They then attach and develop a pedal disk that grows into a new anemone. The Nettle anemones are generally unavailable to aquarists through retailers. But if you find a Urticina anemone for sale there are some general guidelines to help you buy a sea anemone. When selecting a Nettle Anemone, make sure the color is good and their mouth is not gaping open. They should be attached to something. Make sure there is no damage to the foot area, which can result from pulling an anemone off its surface. To take a Urticina anemone from another aquarium, use a thin blunt item like a credit card and gently wiggle it under the foot, slowly nudging it away from the glass. If its attached to a rock, ideally you can simply purchase the rock as well. if you cannot purchase the rock then directing water at it or wiggling the rock gently upside down under water while tickling the foot can work.